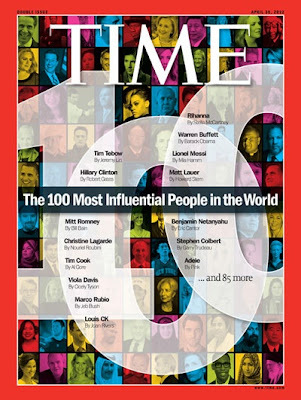 Who would you choose, from the global icons, artists, leaders and entrepreneurs, given a chance to put together a list of the most influential people of the year? Earlier this week the TIME magazine published their annual list of the Top 100, and it is fascinating to see how our perception of the current top 100's changes in mere 12 months, and who made it through the test of time. Tiger Woods, Lance Armstrong, Oscar Pistorius, are just a few of those who got to the top 100 in the past few years.. Check out the process of selecting the TIME 100, and let us know your predictions for 2014! Enjoy the spring outside and have a wonderful week ahead.